This is the fifth installment in an 11-part series that introduces some of the best walking trails in Korea. Based on each trail’s popularity and the recommendations of travel experts and the Culture Ministry, The Korea Herald has selected the 10 best places for walking and hiking. The series received funding from the Korea Press Foundation. ― Ed. Hiking trails have sprung up all over Korea in recent years, but the Mount Jirisan trail is a hard one to match in terms of length, diversity and history. 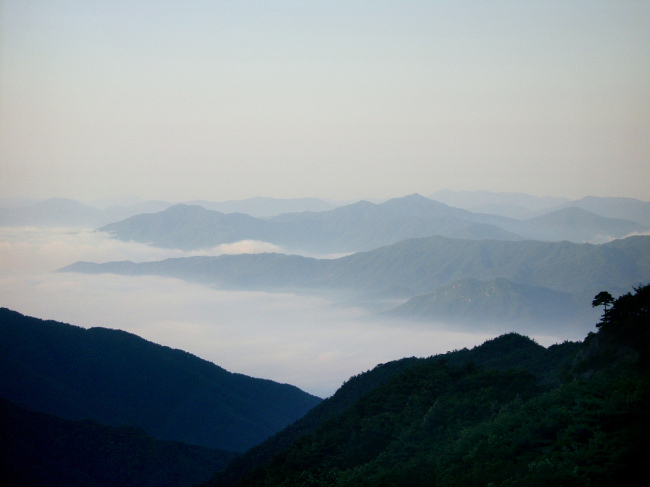 Known as Jirisan Dullegil in Korean, the trail goes around Mount Jirisan on a 274-kilometer course. Divided into 22 sections that range from 9 kilometers to about 20 kilometers, the trail starts in Namwon, North Jeolla Province, taking hikers from one village to another around the mountain that sprawls across the Jeolla region and South Gyeongsang Province. 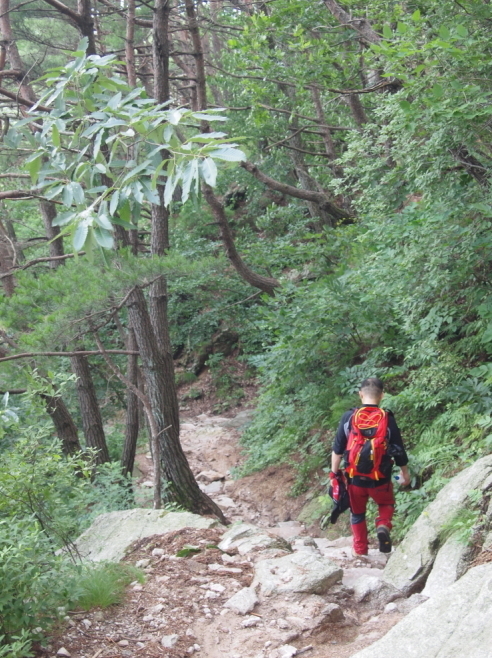 The trail weaves in and out of the foothills of Mount Jirisan, and some sections of the trail pass over rough terrain that could take the unwary traveler by surprise. “I think I was misled somewhat. The information brochure rated this section’s difficulty as medium but it was more like rock climbing than walking in the rougher parts of the path,” said Kim Ju-won, who was walking the second section of the trail, having completed the first section the day before. Section one links Namwon’s Jucheon-myeon to Unbong-eup through a 14.3-kilometer path that winds through the foothills of Mount Jirisan. The second section is about 10 kilometers long and stretches from Unbong to Inwol. Aside from the terrain, the trail in the summer presents another challenge: swollen streams. The trail passes over a number of streams and, although there are stepping stones, the rising water level during rainy season makes it almost impossible to cross on foot while staying dry. Food and water can also present problems for those hiking in the summer, which is the off-season for the trail. While there are makeshift rest stops where locals sell snacks, they are for the most part only open during the busier seasons. Hikers on the trail should also be prepared to run into wildlife, ranging from birds of all shapes and sizes to small frogs, sizeable toads and even the odd snake. Those who prefer the company of humans would do well to avoid visiting the trail in the summer. “The trail attracts the largest number of hikers during the spring and autumn months as they come to see the flowers or the autumn foliage,” said Baek Jang-su, a resident of a village in Jucheon-myeon. Guryong Valley, where according to legend nine dragons descend from the heavens once a year, runs parallel to the Jiri trail’s first section and brings hikers back to the starting point. Even without flowers and waterfalls to stimulate the senses, the trail offers plenty to take in. Many of the villages the trail passes by or through were established hundreds of years ago, and thus are steeped in history as well as legends. Villages such as Hwedeok on the first segment of the trail were said to have been founded by those fleeing war during the 1592-1598 Japanese invasion of Joseon. There are also monuments along the trail such as the Hwangsan Battle Monument, which is located about halfway along the second segment of the trail between Unbong and Inwol. In the 1380 battle, Yi Seong-gye defeated a large force of Japanese marauders while he was still serving as a general of the Goryeo Kingdom, which he later overthrew to found Joseon. The trail was developed by linking paths used by villagers in the old days with relatively new roads, and can be confusing at times. Smartphone technology has reached even the Mount Jirisan trail, and various applications show sections of the trail as well as its entirety. Some offer 3-D maps that allow the user to get a better idea of the terrain. Maps are also available at trail information centers ― small huts located at the start of some sections ― and there are signs located along the trail to point the hikers in the right direction. The starting point of each section of the trail is marked by a large signboard showing the section number and the starting and the end points. Numerous sign posts along the trail also give directions to the start and destination. In addition to showing the way, each sign post has its own number that serves as coordinates if a hiker needs to call for help. Although the signs are written only in Korean, the directions to either end of the trail are marked by red and black arrows. Accommodations are surprisingly easy to come by along the trail considering the remoteness of some of the villages. Many of the villages offer numerous cheap accommodation operated by the residents, and there are motels in the most unlikely of places such as villages that appear to consist of only a handful of homes. Contact information for the villager-operated accommodations, called minbak in Korean, can be found in the trail brochures. One of the advantages the Jiri trail offers over other similar hiking paths is the variety of food available as it goes through three provinces. Those walking along the trail in the Jeolla provinces should not miss out on the opportunity to put the region’s culinary reputation to the test. The region is famous for a number of trademark dishes such as mudfish stew, and even what would be an ordinary meal anywhere else on the peninsula comes with a huge assortment of vegetable side dishes that fill the table from one end to the other, all for between 8,000 and 12,000 won. Travelers with delicate palates would also be well advised to look up specialty dishes of the regions they are about to visit to avoid culinary mishaps. Some of the more unusual dishes available include stew made with rabbit and stew made with fresh water crabs with hairy pincers. The locals, however, advise caution as the prices of their trademark dishes such as Namwon’s chueotang ― mudfish stew ― have soared without clear reason in recent years. “I can’t understand it. Chueotang was 4,000 won only a few years ago. You’d think that there was no reason for the prices to go up to around 10,000 won when mudfish is farmed,” said Chang Baek-kyu, who has been a taxi driver in Namwon for 27 years. 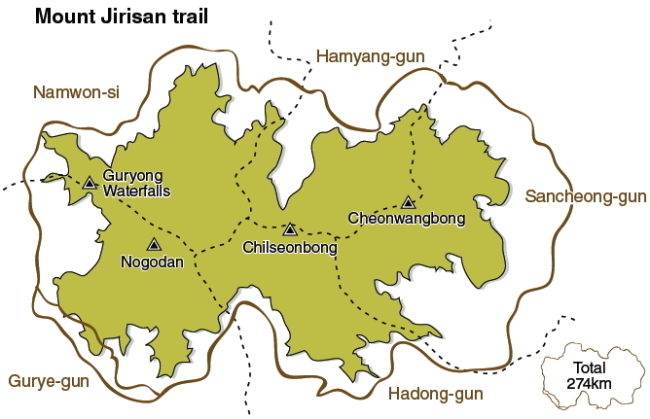 The trail’s official beginning is located in Namwon but as it goes completely around Mount Jirisan over its 274-kilometer course, there is no clear starting point. Still, Namwon is as good a starting place as any, as it is the largest city near the trail. There are several trains ― including the high-speed KTX ― going from Seoul to Namwon, as well as express buses connecting the city to other parts of the country including Incheon and Seoul.